Here’s a quick run-through of the process I use for the figures. 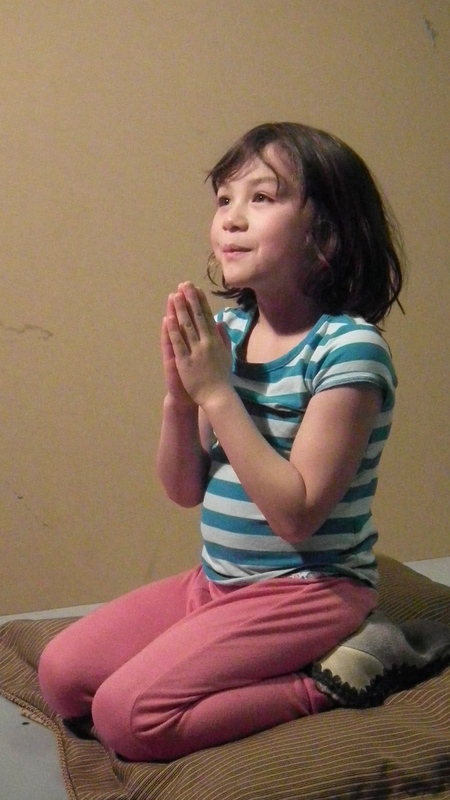 First, a section of my cartoon for Trinity Episcopal with the little Chinese girl (actually, she’s 1/2 English) followed by a photo of the model and a snapshot of the glass she will be painted on. (Ignore the fuzzy horizontal band, it’s just the transom on the window behind the easel). I do the drawing in 2 stages; a sumi-type calligraphic line drawing in black ink that I photocopy before shading with charcoal or graphite. I keep copies of my line drawings for all the figure, to be used later on for glasspainting, which is also carried out in stages. 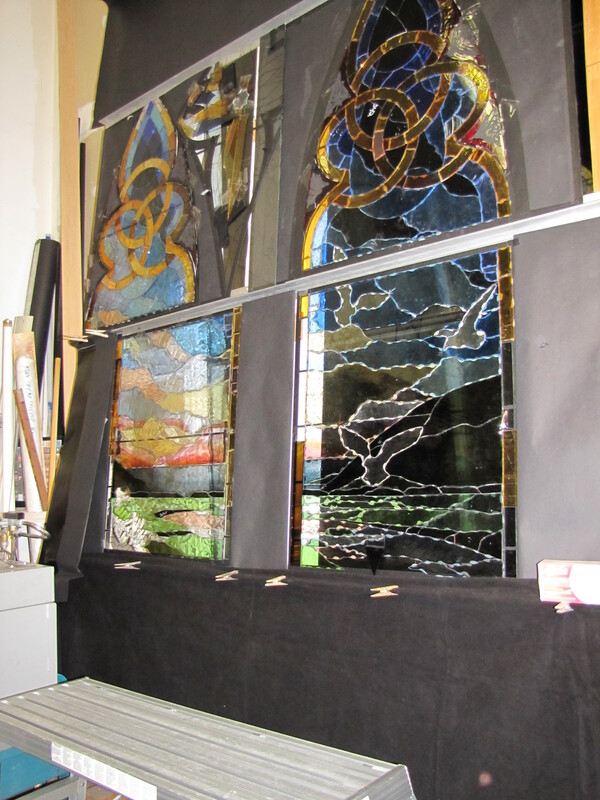 This slide shows the separate stages: the model, line drawing (we call this the ‘traceline’), cartoon and finished stained glass. 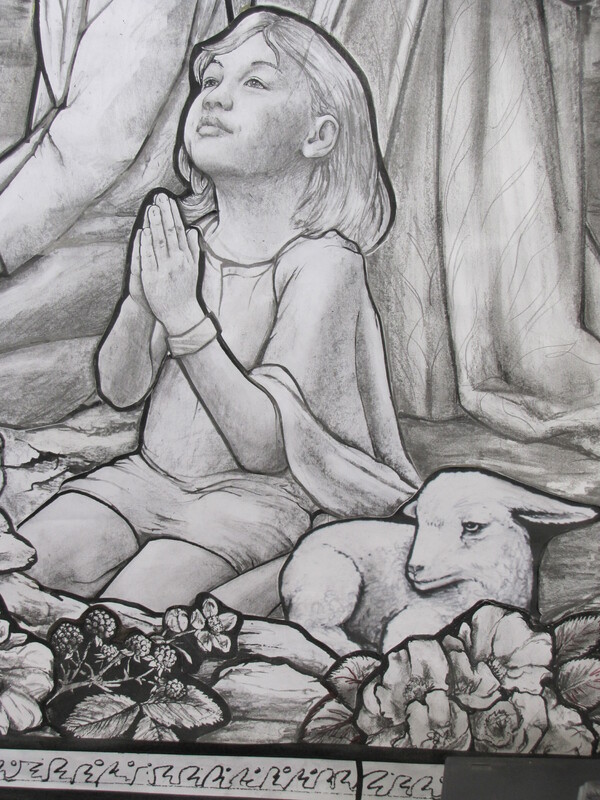 Detail of 25ft window for Marble Church in Manhattan, the scene is the Anointing at Bethany. And just one more sequence (yet another slide from a teaching Powerpoint), again from a window for Marble Church. 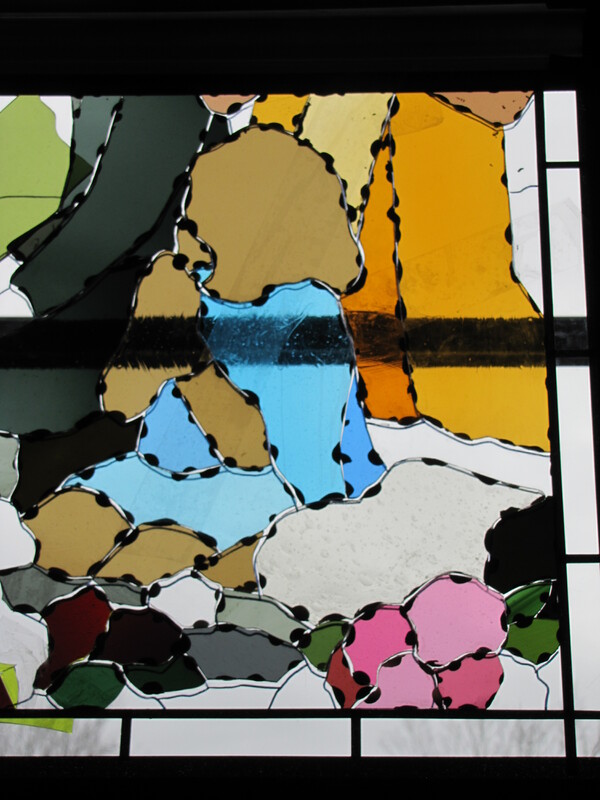 This shows a section of the cartoon, the just-selected bare-naked glass on the easel with blobs of Plasticene, and the completed stained glass. Selecting colour/glass the English way, and why. Q What sort of glass am I working with? I use mostly Lamberts mouth-blown glass, hand-made in Germany. There is only one US distributor, S.A.Bendheim and two warehouses, one in California and the other, fortunately for me, in New Jersey. It’s a marvel to watch these glassblowers make huge cylinders of glass and maneuver them around so skillfully. Watch a video. I also use various other types of glass whenever necessary to achieve precisely the colours I am after. I’m not a purist. Q How do I fix the pieces of coloured glass to the easel plates and why? I use a type of modeling clay called Plasticene to fix up the pieces of glass. This is the way I learned as a young person whilst working for Goddard & Gibbs, the UK’s biggest stained glass studio. Plasticene (or Plastilene in the USA) is applied like thumb wax. It’s a bit greasy but great because I can remove pieces if I need to make changes. It may take several attempts to get precisely the correct colour and value/tone, especially in a pictorial window like this one. Here’s how the easel looks in reflected light, with all the blobs of Plasticene and some strips of clear packing tape over the top panels for good measure. Every piece of glass affects and is affected by it’s neighbors, so the overall composition evolves as you add new colours. Stained glass is basically collage (i.e., you cannot mix the colours) but there are subtle ways of managing how colours appear by choosing neighboring pieces to shift a colour’s temperature, intensity, or to make it appear lighter or darker than it really is. Look at the outstretched hand of the woman below. It is cut from precisely the same glass as her face but it looks too dark because it’s surrounded by so much pale blue. I’ll have to change it. 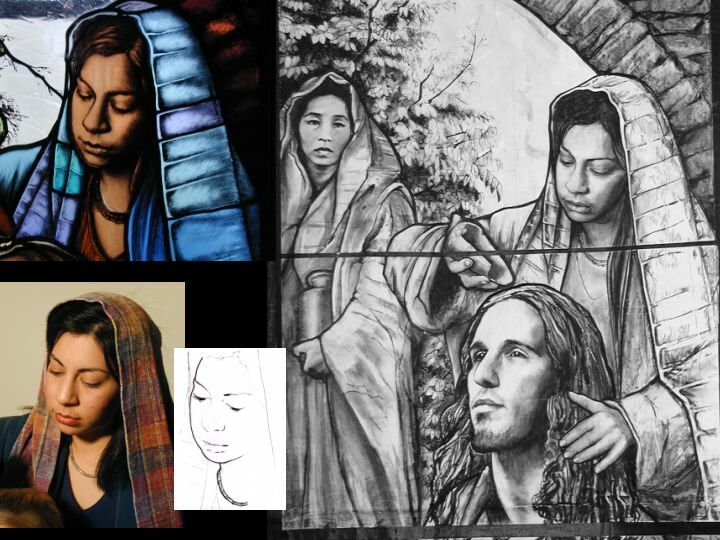 By the way, the woman’s shawl is all cut from the same sheet of glass too (though not the same sheet as her face). It’s one of my favourites (Lamberts 20-1067) that transitions from pink to peach to orange across a single sheet. I love using different areas of the same sheet in close proximity because the colours harmonize so beautifully. I’ve been choosing subtly cooler colours for the far right of this window (bluer greens, silvery grey in the river, etc) and staying warmer to the left, hence the warm glow on her headdress. 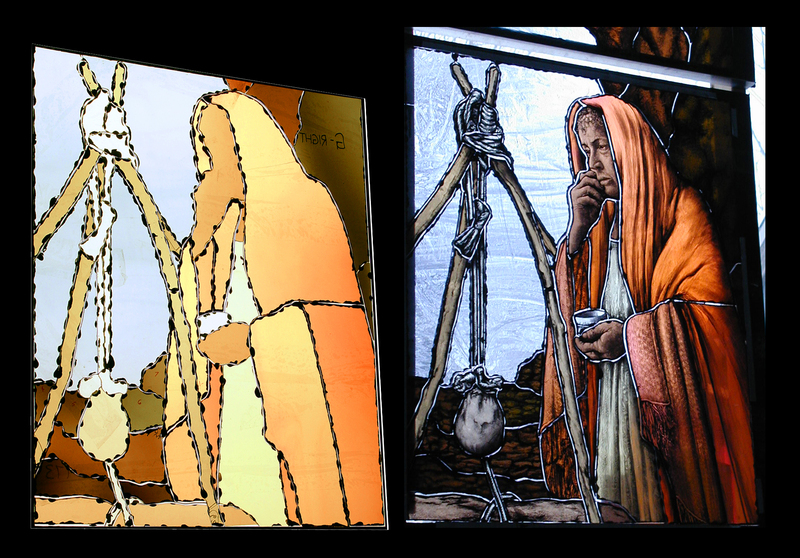 Here’s a video about my work for St Henry Church in Nashville that describes my glass colour selection process in more detail. Q Why do I choose my glass in this laborious fashion? I realise that many people select their glass on the light table but I find this pretty challenging. Colours do not appear accurately. The lightbox is uneven, so it’s hard to read tone/value. I cannot read the texture of the glass accurately because it appears flat and opaque, whereas at the easel it sparkles or ripples with light. Although I paint and fire pretty much every piece of glass in a window, I’ve developed methods that maintain pure transparency almost all areas, so the liveliness of the glass is not lost. 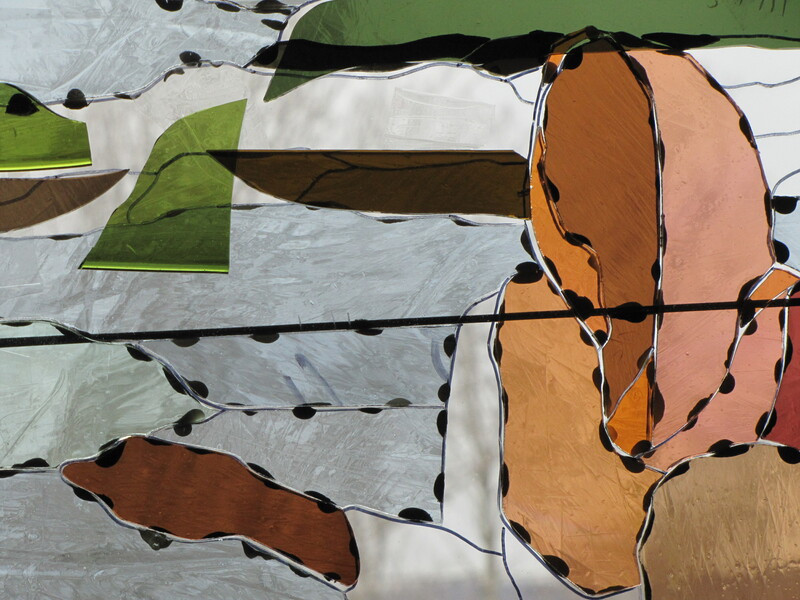 Manipulating transparency is one of the true delights in making stained glass. Colour/glass selection is a key part of my process. These slides show how the cartoon, cutlines and glass selection all come together in the end. They show work-in-progress on a 25ft window I designed, cartooned, cut and painted for Marble Collegiate Church on 5th Ave in Manhattan. Rambusch Decorating Co did the fabrication and installation in 2002. Thankyou Martin Rambusch for giving me such a great opportunity.